With college football’s home stretch slowly coming into view, this Saturday offers fans another batch of important games that will lead us closer to clarity. Two national championship contenders hit the road against ranked teams while several other hopefuls remain locked outside the top of the BCS like single guys waiting fruitlessly to get into an exclusive South Beach nightclub. The NFL also has several key division matchups as well the league’s most surprising undefeated team looking to stay perfect on the road. Oh… there’s also a little thing called the World Series going on, so make sure your cable bill is up to date. Ssssshhhh…. don’t call it the World’s Largest Outdoor Cocktail party anymore. The powers that be don’t like the image it portrays. As if the 75,000 fans that pile into the Gator Bowl this Saturday won’t be imbibing their favorite brand of bourbon. On the bright side, that’s more fans than have seen a Jaguars home game all season. While still undefeated, Florida is a far cry from the offensive powerhouse it’s been in years past, particularly in the red zone. The Gators have scored only 16 touchdowns in 36 red zone attempts this season, not exactly reminiscent of their national championship runs. The good news for Florida is that they’re still controlling time of possession and their defense ranks among the best in the nation in most categories. A Gator victory could seal the SEC East but the Bulldogs won’t roll over, even though they’ve lost 16 of the last 19 meetings. Most Gator fans remember the Georgia’s end zone celebration two years ago. 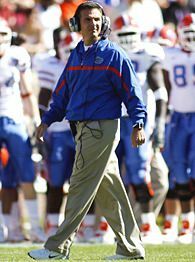 Florida exacted its revenge by winning 49-10 the following year, calling two timeouts in the final seconds to rub it in. Look for Urban Meyer to give Tim Tebow every chance to break Herschel Walker’s all-time conference rushing record against the school he played for. Who would have thought a former Florida State Seminole would have affected the outcome of this weekend’s Texas-Oklahoma State game? Yet, Deion Sanders’ relations with wide receiver Dez Bryant landed Bryant a year-long suspension. Bryant, Oklahoma State’s best wide receiver, scored 19 touchdowns last season and was their leading receiver this year before being suspended by the NCAA. Just because they’re a man down, however, does not mean Texas should overlook the Cowboys as they’re the Longhorns’ biggest remaining obstacle to a national championship bid. 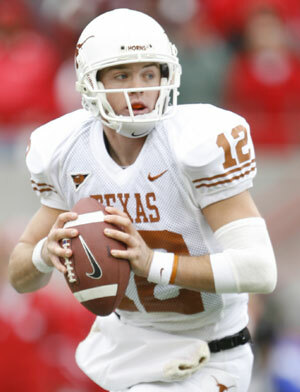 Texas quarterback and Heisman hopeful Colt McCoy is coming off a near perfect weekend where he went 26-for-31 and threw for three touchdowns against Missouri, yet he has never won in Stillwater. Iowa, USC, TCU, Boise State and Cincinnati fans will be watching this game with bated breath, hoping for entry into that exclusive nightclub after all. Before USC gets on the other side of that velvet rope, they’ll have to take care of a little green. The winner of Saturday night’s Oregon-USC game will likely win the Pac-10 and keep their national championship hopes alive. The loser will not. USC has won an impressive eight consecutive conference titles. Oregon, who currently leads the conference, would like nothing more than to end to that streak. After getting off to a strong start, the Trojans have allowed 62 points in their last two games, how very un-USC-like. They’ll need to shore up their defense in Eugene this weekend against an Oregon team that can light up the scoreboard. Expect the cheese steak, kielbasa and cholesterol count to reach an all-time high in Philadelphia this weekend as the World Series is not the only big game in town. Philly fans will be treated to Eagles-Giants in the afternoon and Phillies-Yankees at night, a rare opportunity for the town to double up on some brotherly hate for the Big Apple. Good thing the 76ers aren’t hosting the Knicks that Sunday for the town might run out of draft beer. After starting 5-0, the Geeeeeee-Men have dropped their last two. The Eagles are coming off a Monday night victory over Washington but lost the previous weekend to the hapless Raiders. As usual, the standings atop the NFC allow little room for error. This one should go down to the wire. 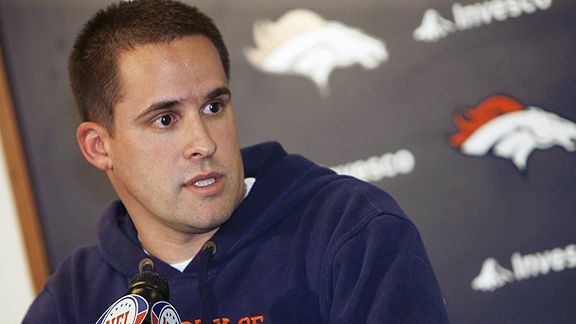 What Josh McDaniels has done in a short time as head coach of the Denver Broncos is nothing short of amazing. While other rookie head coaches in the league are still struggling to win their first game (Raheem Morris, Steve Spagnuolo), McDaniels has yet to lose. In the off-season, Denver looked like a team in shambles with a new quarterback (Kyle Orton) and a disgruntled wide receiver (Brandon Marshall). Not so much anymore as peace and harmony has taken over in the mile high city. McDaniels brings his perfect record into Baltimore this weekend, trying to continue Denver’s hot start. We’ll see if Ray Lewis, Ed Reed and the gang have anything to say about Denver leaving town 7-0. Have we had enough Brett Favre talk yet? Believe it or not, there are two-year old football fans who never saw him play in a Packer uniform. We’re once again subjected to the endless Favre-Rodgers-Packers drama which discounts the fact that this game itself is actually of great importance. And for all you Favre-fans, you’re in luck for Fox will feature a Favre-Cam the entire game. That’s right. Three and a half hours of nothing but Favre, which is considerably less than ESPN usually shows in a day. Here’s hoping there’s no need for a mid-game trip to the lavatory. And why is that we only discuss what this game means to Favre and not what it means to the quarterback who succeeded him? Don’t discount Aaron Rodgers’ desire to prove Green Bay made the right choice. 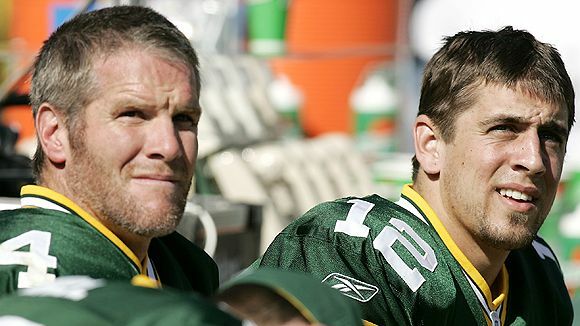 The game should be exciting, but wouldn’t most fans rather inject Favre and Rodgers with some truth serum, then have them tell us how they really feel about each other? Now THAT would be a pay-per-view event worth watching. The Vikings sacked Rodgers eight times earlier this season. If the Pack wants a chance in this one, their offensive line will have to provide a little more protection. The New Orleans Saints march on. 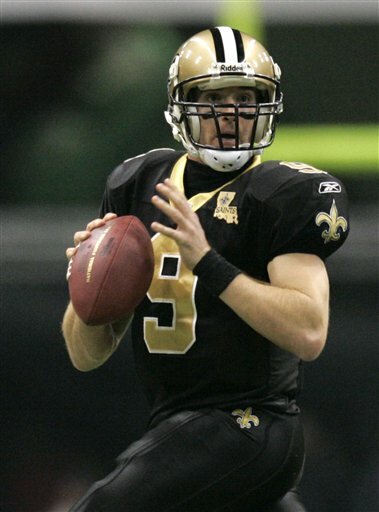 Their offense behind Drew Brees, Reggie Bush, Marques Colston and Mike Bell remains the most prolific in the NFL. The Saints are giving opposing defenses and scoreboard guys around the league a workout. They came back from down three touchdowns last weekend in Miami to finally filet the fish and with ten games to go, we’re starting to hear premature talk of a perfect season. We’ll see if the Falcons can bust their bubble on Monday night. With ten over-.500 NFC teams fighting for six playoff spots, the Falcons will have to give it their best to do what no other team has yet to do this season… and that’s beat the Saints. This entry was posted in Diamond, Pigskin, Screen and tagged Aaron Rodgers, Atlanta Falcons, Baltimore Ravens, Brandon Marshall, Brett Favre, Colt McCoy, Deion Sanders, Denver Broncos, Dez Bryant, Drew Brees, Ed Reed, Florida Gators, Georgia Bulldogs, Green Bay Packers, Herschel Walker, Jeremiah Masoli, Josh McDaniels, Kyle Orton, Marques Colston, Mike Bell, Minnesota Vikings, New Orleans Saints, New York Giants, NFL, Oklahoma State, Oregon Ducks, Philadelphia Eagles, Raheem Morris, Ray Lewis, Reggie Bush, Steve Spagnuolo, Texas Longhorns, Tim Tebow, Urban Meyer, USC, What to Watch, World Series by Chris Humpherys. Bookmark the permalink. That NFC South match up between the Saints and Falcons ought to be really good. Any takers on whether or not the Saints’ll put up at least 30 on the Falcons ? I hear that Lane Kiffin is now into Weezy ? He apparently uses his music to motivate the Vols during training ? Wow ! Who knew ? If USC should fail against the Ducks, well don’t shoot the messenger. But Pete Carroll ought to think about heading to the Himalayas for a retreat and rededicate himself and his players. Their program as of late has been filled too many ‘powder puff’ teams . That when they go to play the big kids on the block, they tend to look as if they’re running scared. Why is that Skip Bayless still wants to rag on LeBron ? After going off on Ocho Cinco , he’s still taking aim at LBJ and calling him over-rated. What else has the kid got to do to prove himself ? Not everyone is going to live up to Jordan. And from what I remember it took Jordan a few years before he was able to overcome the Celtics, Lakers and the Pistons. Never mind the fact the LeBron has never had a Pippen type caliber player at his side. But then who said that Bayless was all that intelligent to begin with ? The guy is a friggin’ moron and he ain’t the sharpest tool in a tool box. He may well be the bluntest one though. But then again when measured against Whitlock and Stephen A , he all of a sudden seems ever so bright ! Tee hee ! Al… I like the Falcons’ chances to keep that Monday night game close. Saints just lost a key offensive lineman for the season. Nice to hear something else about Laney. All I hear these days is how he’s getting reprimanded by conference officials. Guy’s got more slaps on the hand that John Calipari. Oregon can keep that one close if USC’s defense fails to show up again. I’m finding it more and more difficult to listen to Bayless, who I’m convinced now just likes the sound of his own voice. Do you think, in his private time, he pleasures himself to his own image? The Falcons could well pull of the NFL surprise of the weekend. That’s unless Vince Young and the Titans do something exceptional. As for Lane Kiffin , he knows no other way as to how to get things done. He wants to be seen as the loudest and as the biggest guy in a room. Nontheless he’s still liable to lay down like a dog once he gets kicked in the balls. Bayless is ESPN’s answer to Newt Gingrich , Rush Limbaugh , Glenn Beck all rolled up into one rather unique and unimaginative person. He basks in his own limelight. And much like A-Rod’s pose in front of that mirror, I’m now beginning to question his manhood and intelligence. Al… not even sure anyone will be watching that Titans game. If Vince Young started at quarterback, would anyone listen? We’ll see what the future holds for Kiffin in Knoxville. They’ll have the talent. We’ll see if translates into wins. They should have won that Alabama game. I’m wondering how long it’ll take Bayless to say something on air that he’ll get suspended for. Hasn’t the NFL allowed them more time in order to avoid the blackout ? In order to do so they’ve been allowed a further 24 hours to sell the designated tickets required to avoid such a maneuver. Down the line it’ll be the same thing with the Bucs. And even if they’re the only game in town at present. I doubt anyone will want to spend their hard earned cash wanting to watch sheer unadulterated crap from the get-go ! Here’s my piece on Skip Bayless who’s soon to become persona non grata in LeBron’s book and completely off his Christmas and interviewee list. Bayless probably doesn’t deserve that much of your attention but you know I’ll swing by anyway. I’m thinking Raymond James should be at about 70% capacity by season’s end. Might be a good time to grab a ticket for $5. Loved the helmet graphic so much, I stole it! (for your publicity).lol GO, DAWGS!!! What with the Glazers said to be down quite possibly to the tune of $35- $40 million because of their investments with Bernie Madoff. I guess that they’ll now need every red cent they can muster courtesy of Man Utd and the Bucs ? As for Young and the Titans , this is essentially Fisher‘s last chance to gain some semblance of reasoning out of the season. A sub-par one and I do believe that Bud Adams may well have to bid him goodbye. Well the Phillies’ bats were somewhat dormant last in game two against the Yankees. This series is now suddenly building up and it could end up being one of the better World Series in recent memory. Al… that’s a bizarre story. I need to read more into that. If the Titans don’t want Fisher, maybe the Colt’ll take him. He’s already got the jersey. Not looking good for the Phils, man. The Colts are happy with what they’ve got in terms of a coach. It’s as if they haven’t skipped a beat with the departure of Dungy and the succession of Jim Caldwell. As for Fisher , I think his job is safe for now. Bud Adams , the Titans’ owner believes in him implicitly. Well the Gators lowered the boom on Georgia in more ways than one. Can’t but feel sorry for Mark Richt. Preseason the Bull Dogs were highly regarded. As of now they lay somewhere between Bin Laden and Bernie Madoff in terms of popularity across the panacea of the nation. How is that Raiders’ coach Tom Cable continues to be treated with such a degree of reverence ? If the ESPN expose’ on a segment shown this morning is anything to go by, then this guy is an out and out thug and a spousal abuser . He’s beaten his first and second wives. And then followed that up with the assault of a former girlfriend. But yet his current wife has stated that he’s beyond reproach. Mind you this is the same woman (prior to their marriage -he’d been seeing her whilst being involved with the victim)who in an affidavit stated that while Cable and former girlfriend were arguing she was unable to hear what was being said. However the police records show that the victim ended up with a bruised cheek and a severely bruised arm and hematomas over her body. Skip Bayless Says He’ll Get A Life When LeBron James Wins An NBA Title ……. The next 3 games are at home. Maybe that will matter. Because of the very story Sileo has been indefinitely suspended by WDAE . The Glazers have come out openly and made a public statement saying that the financial health of the Buccaneers and the Glazer family is healthy. However they’ve failed to address the issue concerning the soccer club that they’ve laden with in excess of $1.15 billion worth of debt. But I guess that counts for nothing in their eyes ? How about these as perhaps the most disappointing free agent signings in the NFL ? The ‘skins’ Albert Haynesworth and the Seahawks T J Houshmanzadeh ? All that money and so little production to show for it ! Free Agency It’s Never Been That Simple …. Dan Sileo Suspended After Bucs Financial Comments …..
Just talked with acid-tongued local sports radio host Dan Sileo, who has done something few in the media have been able to do in recent years: He elicited a response — and an angry one — from reclusive Tampa Bay Bucs ownership. Bucs co-chairman Joel Glazer, one of the sons of owner Malcolm Glazer, angrily denied a report by Sileo on Thursday that his family might consider selling the team because the Glazers have lost more than $400 million in Bernie Madoff’s ponzi scheme. Joel Glazer, in what some are saying is an unprecedented move, came out with a public statement Thursday in which he blasted Sileo and threatened to take action against Clear Channel, which owns the stations where Sileo is heard. I was listening to Sileo Thursday morning when he said his information was based on a friend who works for the Securities and Exchange Commission (SEC). The friend, Sileo said, told him the Glazers had lost $440 million with Madoff. Sileo also said in passing that Magic owner Rich DeVos was tied to Madoff. Sileo’s morning radio show is heard on both 740-AM in Orlando and on WDAE — the most popular sports radio station in the Tampa Bay market. It should be noted that WDAE has a financial arrangement with the Bucs and carries Bucs programming. Full disclosure: Sileo is one of my guilty pleasures. Even though my critically acclaimed radio show is on a competing station, I like to listen to Sileo and hope his damning information about the Glazers was based on more than just what a friend told him. But I’m skeptical. Sileo has always been controversial and sometimes says outlandish things just to get a reaction. He’s always been entertaining, but credibility has never been his strong suit. Do you want Sileo back on the air? Supposition or not there may well be a case as to the veracity of what Sileo has said. But until the known facts are out there. All one can do is but speculate. Dropped this after USC’s cluster _*ck in Eugene , Oregon. I hear that the Phils want Cole Hamels to undergo a psyche evaluation after his display ? What the hell is wrong with that guy ? Now he and essentially Brad Lidge are seated on the edge of a precipice deciding which of them ought to jump off first. Dropped a piece on the WSOP event like I said I would. It’s all all now culminating wherein it’s do or die for Phil Ivey . I’m Bewildered ,I’m Beguiled But Is This Really A Sport …. ? The mess concerning Sileo and his suspension by WDAE is no less bizarre than I’ve come to expect from a station that’s all too beholding to the Bucs. When are they as such allowed to be objective and allowed to report something. It may well be that Sileo didn’t do enough to confirm the story outright. But at the same time the Glazers have become all to secretive as to their financial situation as it now stands ! They’ve been given us half truths and not much else besides . I can’t wait to see how they’ll with European competition for their soccer club when UEFA enacts its new policy concerning teams their their finances and being able to participate in the top soccer club competition on the continent . Dropped this on Goodell’s and Smith’s visit to Captiol Hill to address the House Judiciary Committee there in D.C. Well as usual it was a bunch of denials and the stuff being said about changes that they both intend to make. Let me know what you think as to the merits of the piece ? Look forward to reading your comments. Feel sorry for Mark Richt? Ha! Now why would I do something silly like that? It was nice, though, to see the Gators in mid-season form. They’re working out their issues and starting to peak at just the right time. Hopefully soon, you’ll be asking me if I feel sorry for Nick Saban. Bev… I’d say a disappointing season had to be in store for the Bulldogs. You can’t just lose Stafford and Moreno and expect to compete. What shouldn’t be lost in the shuffle is that the Dawgs did finish ranked 2nd in the nation two years ago. Too bad for you that didn’t translate into a W on Saturday. That Sileo story is just bizarre, man. 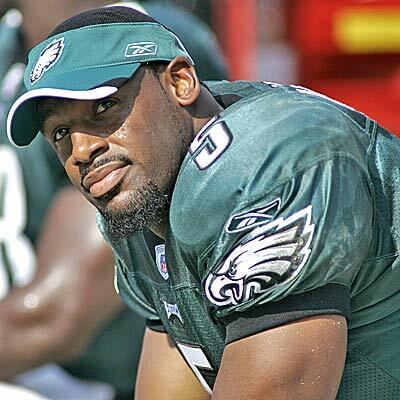 I agree with you on TJ and Haynesworth. I’m starting to think the Redskins organization is akin to being placed on the box cover of Sports Illustrated or EA Sports. Now the black hole of football? Well, at least Albert can afford to buy something nice. Al… I think Pedro’s place in history has already been etched. But for Philadelphia to make him second in the rotation over Hamels, who I believe won Series MVP last season, was a definite indication what something is wrong with this guy. Perhaps he should see John Smoltz’ therapist who seemed to do pretty well with Smoltzy. Little did I realize that Charlie Manuel would have to become psyche analyst now for both Hamels and Lidge. Thankfully they regained their composure and got the win (8-6) they so desperately needed. Now 3-2 they still have something of a chance to facilitate a comeback of sorts. PHILADELPHIA – Phillies pitchers Brett Myers(notes) and Cole Hamels(notes) had a short but tense confrontation in the team’s clubhouse following Game 5 of the World Series, according to one witness, words that stemmed from Hamels’ recent statement that he was eager for his season to end. Hamels, the witness said, responded with an expletive. Before the situation escalated, Myers was guided away by a team official. His quote did not sit well with some teammates, apparently, and even manager Charlie Manuel was perplexed by it. It’s got to be great inside the Phillies’ locker room at the moment. I mean teammates getting into a verbal confrontation -what’s not to like ? Pardon The Interruption But That’s Bull ! And here’s a piece concerning Goodell and DeMaurice Smith’s visit up on Capitol Hill , D.C. Which once again shows that when it comes to posturing these two sides do it better than most. Well the Phillies pulled the proverbial rabbit out of the hat last night with that 8-6 win. Now let’s see if they can win two straight and possibly put the nail in the Yankees’ coffin ? If not then the Yankees’ll slam the door shut once and for all. So no one within WDAE has Sileo’s back at this moment in time ? I expect that Clear Channel wants him to sit it out and stew then , without pay ? But then again what shouldn’t we expect from a station that essentially eats , sleeps and s_its anything at all , that has to do with the Buccaneers ! Dropped this on the now festering wound that’s opened up between Magic Johnson and Isiah Thomas. It Was The Best Of Times It Was The Worst Of Times The Fall And Rise Of Isiah Thomas ………. Al… I’m thinking that Hamels statement was much ado about nothing, but it gave everyone something to talk about for the day. Al… so what’s the latest on the Sileo situation? Are the Glazers threatening legal action against ClearChannel? I doubt that the Glazers’d be in a position to make a threat of legal action against Clear Channel or Sileo for that matter. First of all they’d have to prove that Sileo’s statement did them irreparable harm to their reputation. But also bear this in mind they’d also have to prove that he was saying was slanderlous and not true. And the fact of the matter there’s been no evidence to suggest that it might not be true. Sileo is now on indefinite leave ’til clear Channel makes a definitive decision on his future. I don’t know whether or not he’s apologized for the statement made. But it appears that he’s yet to do so. Otherwise he’d have returned to his morning show. So all one can do is to wait until either the SEC comes out with something to substantiate what was said or the Glazers simply let us all in on how bad they’re now said to be financially. And I for one don’t see them opening up their books for public scrutiny. It’s bad enough that they still owe the city of Tampa in excess of $ 5 million. But it’d appear that not even Pam Iorio cares . So why should anyone else for that matter as the city increases rates on them and at the same time cuts back on much needed services there. How f_*ked up is that to begin with ? In all honesty I can’t see the Glazers pursuing this much further. A slander or defamation lawsuit is out of the question. First and foremost they’ve got to prove that Sileo’s statement did them irreparable harm and at the same they’ve got to show evidence that it wasn’t at all true. And as of we’ve no way of really knowing whether or it’s fact or just speculation on someone’s part. Never mind also that the Glazers have been less than honest concerning their financial situation at present. Sileo is on indefinite leave of absence while Clear Channel deals with the issue. He may or may not return to WDAE. If he goes then it’s the atation’s loss. As he has their most popular morning time talk show in the local market-bar none. Phillies Yanks game 6 tonight , watch out for the fireworks as it’s now all or nothing for both teams. Whoever wins has the outright advantage. A win for the Yankees and it’s all over. A win for the Phils and it’s everything to play for in game 7. Can’t get any better than that. Dropped this on the NFL’s Thanksgiving Day schedule. Thanksgiving Is Just Around The Corner And What’s The NFL Serving Up Not The Detroit Lions Again …..? So, Al… who took over Sileo’s radio gig for the time being? You know I’m never up that early. Re: the Series, I can still see it going either way. We’re finally getting the drama we were expecting. Sileo’s morning show is being done by his associate producer and co-host Darek Sharp. As I alluded to earlier no one is really sure what the stance taken will be by Clear Channel . As to the series the ball is now in the Phillies‘ court and it’s now up to them to make a show of it, if they’re to prevail and win it all. If not then the Yankees </a will take full court, press ahead and win it all. That may well be the scenario preferred by most. Not I, said the fly ! And how about Snyder threatening the Redskins’ fans with the law if they don’t pay up in full for their premium seat ticket ? Furthermore , he’s also going to initiate ban for signs or placard being brought into Fedex Field for the ‘skins’ home games. How stupid is that given their current predicament ? Dropping knowledge as always , your way . So here goes , my latest piece. Thanksgiving Is Just Around The Corner And What’s The NFL Going To Serve Up Not The Lions Again .. ? Here’s a link to his(Sileo’s) site at 620WDAE. ’til You Do Right By Me Everything You Even Think About Gonna Fail ……. Here’s to Whoopi Goldberg’s Celie for uttering those memorable words in ‘The Color Purple’. Hopefully it’ll remind Snyder how he’s short changed the fans there in DC ? Talk ’bout being a lame duck coach in Jim Zorn – but to have basically of your duties essentially taken away from you ? What next – no locker room privileges ? Snyder? You mean the man who stands on a golden footstool during interviews? What’s a fan, for example a Redskins fan that’s grown up with the franchise, to do when he comes to realization that year after year, his team, and those in charge of making decisions are woefully inadequate. Is it then excusable to jump ship? Like I told you earlier, Al. Zorn’s desk is getting closer to the door. Who takes that job? Gruden? I don’t know that Gruden has the mindset to take job to begin with. Even it were to pay in excess of $ 6.5 million a year. He wouldn’t have autonomy over the personnel decision making to begin with. As that’s where Redskins’ Exec VP of Player Personnel , Vinny Cerrato comes in. That happens to be his baby. And as we know Gruden is definitely his own man in that area. He seems to think that only ‘he’ can assess college talent when it comes to the NFL. And as we all that’s a complete joke to begin with ! I’m inclined to think that Snyder may well take the college route and go after someone like Iowa’s Kirk Ferentz or someone else within that arena who’s coaching a top ranked program at the college level and someone who knows how to recruit , assess and coach ‘real talent’ . Then if Cerrato’s the problem, get a guy like Gruden who can do both. He’s already gone the college route and that didn’t pan out too well.